Whether you’re ready to begin your journey or still have questions, we’d love to hear from you. Please drop us a line using the form on this page and we’ll get back to you as quickly as possible. "They will show you how to create the dream work life you are meant to live and how to teach others to do the same." “The New Agreements Tools create a framework for a holistic approach to the operations of an organization. It embraces the development of the people while setting them up to be successful through optimization of the systems in which they must work. “As a founder of a rapidly growing high technology company with now more than 240 associates, we have sometimes been challenged by change, including the need to grow as leaders. I had the privilege to attend one of David’s 5-day New Agreements and 7 Tools Leadership Programs. It was greatest five days of my life! I saw…..no, I experienced the New Agreements and 7 Tools. Combine that with the spirit, love, and energy we all shared and it was a truly transformational experience that I’ve been able to take back to my partners and my people. We’re now implementing what we learned with all our associates worldwide. My partners and I are excited to grow as leaders." 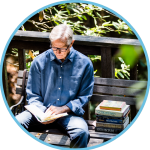 “David has an intuitive sense of business in the way he works with his clients to, through his Four New Agreements and Seven Tools, accomplish extraordinary results in their companies. David has worked with the best, and still they learn from him on what they need to do to develop their people and grow their businesses. His model for change delivers in multiple ways, above all enriching the leadership team with greater understanding about how to lead and manage change. I recommend David as a mentor, colleague and advisor to any and all who desire not only to improve but to take a leap toward leadership and management mastery." Frederick ‘Rick’ BuchmanPublished International Author and Consultant, and President and CEO at Hayward Enterprises Inc.
“I met David at the Deming Seminar in 1992 and was immediately impressed by his knowledge and abilities. I subsequently have come to know David as a mentor, coach, and most importantly, as a good friend. With his New Agreements and Tools, he takes leadership and management to a new level, the level of true transformation of not only systems and processes, but of one’s self. I am honored to know David and it is a true privilege to work with someone who is a real pioneer in leadership." “I’ve worked with David in many capacities, from personal exploration to implementation of his New Agreements and 7 Tools in my business. Linda and David have also done some amazing work with my sister around discovering and pursuing her higher purpose for work. The New Agreements and 7 Tools bring it all together for anyone willing to do the work. Each time I’ve worked with David, the experience was transformational. Love David." “I have been waiting for years for a training that has it all. David Dibble has created (!) a brilliant program that combines the most effective coaching techniques (the seven tools) I’ve ever experienced, with a solid foundation in business systems. Best of all, their approach integrates the spiritual masteries of don Miguel Ruiz’s best selling, The Four Agreements. This winning combination is already transforming my coaching clients – and me!" “David Dibble has created (!) a brilliant program that combines the most effective coaching techniques I’ve ever experienced with a solid foundation in business systems. “I have been waiting for years for a training that has it all. David Dibble has created (!) a brilliant program that combines the most effective coaching techniques I’ve ever experienced with a solid foundation in business systems. Best of all, their approach integrates the spiritual masteries of don Miguel Ruiz’s best selling, The Four Agreements. This winning combination is already transforming my coaching clients – and me!" "Uncovering my full potential as an executive coach in The New Agreements and 7 Tools Program has been an amazing experience! The leading edge New Agreements and 7 Tools methodologies have shown me what business transformation is truly supposed to be about. In the training I freely explored my path as a leader and at the same time, added the Tools to my skill set as a manager and leader. This program is critical for business people wishing to expand their management and leadership skill sets while improving company culture and performance." "I was on a journey to Teotihuacan, the pyramids outside Mexico City, to accelerate my growth as a leader, which David and Linda led. David asked if anyone wanted to do some higher purpose vision/Right Action work to address major issues in his/her work life. I volunteered knowing that I was feeling like my work life was falling apart. In about an hour, David made my whole life visible through the 7 Tools where we all could see it. It was shocking for me. I hadn’t thought it possible that I couldn’t see my own life until we went through this process, but it was true. We identified what I needed to do (Right Action) to resolve my big issues at work and created an action plan and support system. In 45 days, I was able to completely re-create my work life, all through the 7 Tools and taking Right Action. I’m now doing what I like to do. My boss is happy. My relationships with my co-workers have improved significantly. I even have much needed time for myself. This work is amazing!" "I had the privilege to work with David. David provided the leadership, knowledge and wisdom to take our group where we could never have gone on our own. David has such talent and passion for seeing the world in a different more meaningful way and opening space for us to do the same. His insights gave me the ability to expand the way I see my work and the world. Thank you David for opening my heart and mentoring me toward systems thinking and living the New Agreements." "David and I worked together for almost two years. His New Agreements approach and Tools helped change a hospital organization from silo-thinking into an effective, systems-oriented unit. He did this through his seven tools by teaching, prodding and coaching people to go to places they never thought they could achieve. He helped look at healthcare from a perspective that few other people in the business have done. Our organization was a much better hospital and people were better as a result of implementing the Agreements and Tools." READY TO HAVE DAVID BLOW YOUR PEOPLE'S MINDS?